ABS (Anti-lock Braking System) is considered as one of the best safety features available in the motoring industry. It ensures that bike does not skid while harsh braking. 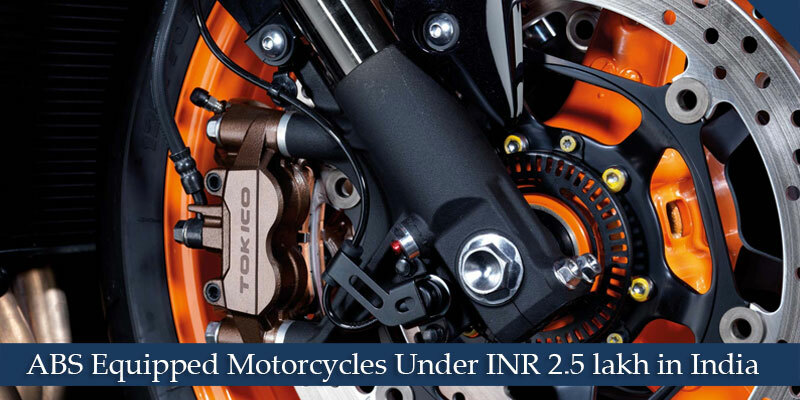 From the available manufacturers in the Indian market, a few are offering this advanced safety fitment as standard or as optional in their entry-level performance motorcycles. Starting from 2018, the government of India has mandated ABS as a must have a safety feature in all the two-wheelers. As a part of safe riding, one must choose ABS fitted motorbike and to help for the same, have a look at this post which shares brief details of ABS-equipped motorcycles under INR 2.5 Lakh in India. The Jawa is a pure retro-classic from Jawa Motorcycles resurrected by Classic Legends, a subsidiary of Mahindra two-wheelers. Physically, one wouldn’t be able to differentiate it from the old generation Jawa as it was the demand of automaker to keep it original as of one provided in the 70-80s. There are a few cosmetics which tends to hold the attention of onlookers are unique headlight, dual tone fuel tank, peanut shooter type twin exhaust setup and upfront fork shrouds that are extended to the instrument cluster. Under the fuel tank, it is packed with an all-new 293cc, liquid-cooled, single-cylinder motor makes out 27PS and 28Nm of peak torque. The transmission unit is a 6-speed constant mesh unit. Further, it gets disc at front and drum brake at the rear wheel, integrated to single channel ABS. Jawa Forty Two is a sportier offering over the pure retro Jawa model. It is priced at INR 1.55 lakh (ex-Delhi) and received a host component different from the Jawa that helps in standing bike apart in the crowd. Including the blacked out front forks, an off-set instrument console and a round shaped halogen-lit headlamp. Beneath the fuel tank, it shares the powertrain from its retro sibling Jawa. the newly developed 293cc, liquid-cooled, single-cylinder motor is capable of churning out the peak power of 27PS and 28Nm via a mated 6-speed gearbox unit. The Interceptor 650 is Royal Enfield’s one of the 650cc flagships. Launched at an introductory price tag of INR 2.50 lakh, the cruiser comes packed with brand’s powerful engine produced yet. Along with it, the bike which is based on an all-new frame developed by RE subsidiary Harris Performance in the UK also gets the rider’s aids of dual channel ABS as standard. However, there are other RE products which have been updated with this safety feature and in the queue to get the same by April 2019. Under the fuel tank, packed with a new 649 cc, air and oil cooled, parallel-twin engine, the RE Interceptor 650 uses the churning power of 47bhp along with 52 Nm of torque. The engine is mated to a 6-speed gearbox integrated with a slipper clutch. The pair of 41mm conventional telescopic front forks and twin shock absorbers at the rear manage suspension duties. While a 320mm front disc and 240mm rear disc handle braking on the bike. Royal Enfield Classic 350 Signal Edition is a special edition version available on sale at INR 1.62 lakh (ex-showroom, Pune). Basically, a homage edition, the Signals Edition pays tribute to Indian armed forces specifically to the Indian Army Corps of Signals. Altogether, it is the first Royal Enfield to get ABS in the entire lineup as standard. Cosmetically, different from the standard model, this special edition model gets blacked out chrome bits like the headlamp bezel, engine, crankcase cover and more that contrasts well with the offered colour schemes like Airborne Blue and Stormrider Sand. In addition to this, the seats are brown leather units and the fuel tank is stencilled with a unique numbering and a special emblem to pay homage to the Indian army. Mechanically, it uses 19 bhp and 28 Nm developed from 346 cc single-cylinder, air-cooled mated to a 5-speed gearbox. Royal Enfield Himalayan that is one and only adventure tourer in Chennai based bikemaker’s lineup has also been updated with Anti-Lock Braking System (ABS). The ABS version of the Himalayan has priced at INR 1.79 lakh (ex-showroom, Mumbai) that is around INR 11,000 premium over the non-ABS version. In addition to this, the company also offers a special edition model namely the Himalayan Sleet that costs INR 1.80 lakh (ex-showroom, Mumbai). Besides ABS introduction, the adventure tourer did not see any mentionable changes. It is powered by the similar fuel injected 411 cc long-stroke, single cylinder, air-cooled engine. Mated to a 5-speed gearbox transmission, the engine is rated to make out 24 bhp at 6500rpm and 32Nm of peak torque at 4250rpm. Royal Enfield Classic 500 has got the ABS in India, for which the legendary cruiser bikes maker is asking for an introductory amount of INR 1.99 lakh (ex-showroom). The other two color options-Matte and Chrome trims will price you at INR 2.02 Lakh and Rs 2.10 Lakh respectively. Other than this, Royal Enfield also has non-ABS variant on sale with pricing INR 15,000 lesser than the standard variant. The color options for the non-ABS variant are Tan, Black and Silver as well. The introduction of the ABS has improved the braking for the Classic 500 to a greater level. Now the braking setup which comprises 280mm disc at front and a 240mm disc at the rear is in association with the dual-channel ABS that ends up the risk of wheel locking and avoids uncontrolled skidding. Powertrain is all similar, a 499 cc single-cylinder air-cooled engine. It is rated to make out 27.2 bhp at 5,250 rpm and peak torque of 41.3 Nm at 4,000 rpm via a mated 5-speed manual transmission. Getting ready to comply with the upcoming BS-VI emission norms from April 2019, Royal Enfield has started to update its motorcycle lineup with ABS feature. The new to join this riddle is the Royal Enfield Thunderbird 350 X that was launched in February 2018. Other than the ABS, the major highlights of the Thunderbird 350X ABS include its vibrant color schemes contrasting to blacked out engine and cycle parts. In addition to this, there are the newness of a flat handlebar, seat and significant riding posture along with new 9-spoke black alloy wheels shod up with tubeless tyres. Under the fuel tank, the motorcycle continues with the 346 cc single-cylinder, air-cooled engine. Mated to a 5-speed gearbox, the engine pumps out 19 bhp and 28 Nm of peak torque. Honda CBR250R which was initially launched in 2011, was the most-sought motorcycle in the sports touring quarter litre segment. But during emission norms transition from BSIII to BSIV, the company temporary stopped the production of the bike as it was not compliant with the more stringent emission norms. It makes the folks believe that the Indian market will finally see the emergence of the CBR300R as a replacement. But Honda CBR250R made a comeback in 2018 model year version. It comes packed with the dual channel ABS as an optional extra. The pricing for the CBR250R ABS variant is pretty higher than the standard CBR250R with a premium of over INR 29,500. The next and the second one in the queue is the Pulsar RS 200 from the Bajaj stable, India’s fourth largest motorcycle manufacturer. It is a whole and sole fully-fairing motorcycle in the offered product portfolio by the giant motorcycle maker. For a reminisce, the company has recently updated this sports runner for the impending BS-IV emission norms on 1st April 2017. The flagship sports cruiser from Bajaj in the 400cc segment, the Dominar 400 is the following product in this run. Recently launched motorcycle received a warm welcome from the audience as it overtook the segment leader Royal Enfield in terms of monthly sales in February 2017. Embellished with an all-LED headlamp, the Dominar 400 gets a slipper clutch and a two-channel ABS fitment as an optional extra for which you have to pay an additional amount of Rs 14,000. The Dominar 400 is powered by a 373.3cc liquid-cooled and fuel-injected single that pumps out a healthy power of 35PS at 8000 rpm along with 35Nm of torque at 6500rpm. The powerful mill comes mated to a six-speed gearbox which helps in attaining 0-100km/h in 8.23 seconds. In order to stop this machine, Bajaj has equipped this beast with a large 320mm front disc and a 230mm rear disc, which are in integration with dual-channel ABS. with all these features, the Dominar 400 is guaranteed a great value-for-money motorcycle in this sub-500cc motorcycle segment. KTM RC390, a range-topping model in offered RC range in India by the Indo-Austrian manufacturer, KTM. Early this year, the manufacturer has updated this RC390 trim with an array of updates including BS-IV compliant engine and an Auto Headlamp feature. Other noteworthy changes are a ride-by-wire technology that ensures smooth throttle response, adjustable brakes and clutch levers and an all-new EVAP system that prevents vaporized fuel loss. Tagged with a price sticker of INR 2,35,735 ex, showroom, Delhi, it is a preferable sports bike equipped with ABS under INR 2.5 lakh category. On powering front, it is equipped with same old 373.3cc, liquid-cooled engine of the previous model. The motor churns out a maximum power of 43.5PS along with 36Nm torque through the mated 6-speed gearbox with slipper clutch. The powerful disc brakes are integrated with the dual channel ABS which offers braking confidence to the rider not only at corners but also in an emergency braking situation. The last and the final in this ABS-equipped bikes under Rs. 2.5 lakh is the 2017 KTM 390 Duke. The naked monster is a value for money bike as it is equipped with several top-level components which also consists a different ABS system which comes with a supermoto model along with the ABS-Off option. With this new supermoto mode, you can turn off ABS in the rear wheel to get off-road and supermoto style riding. It is really noticeable that various bike makers are still not offering ABS on their entry-level performance bikes. While, it could help them to offer the bikes at a competitive price, and they could offer ABS as an option. Hopefully, these all scenarios would change from next year, as it will become mandatory in legislation to provide ABS that will make the manufacturers move towards more proactive safety. Launched in December 2017, TVS Apache 310 is the only fully faired sports bike from TVS Motors. The company introduced this flagship in order to celebrate TVS Racing’s 35 years journey. Priced at INR 2.05 lakh (ex-showroom), the Apache RR 310 is an astonishing product in the super-premium motorcycle segment. In the segment, the motorcycle goes against the KTM RC 390. The Apache RR 310 draws propelling power from 313cc, liquid and oil-cooled single-cylinder engine that is a shared unit from BMW G310R. The mill is rated to churn out 34PS and 27.5Nm via a mated six-speed gearbox. In order to control this beast, along with the availability of disc brakes at both wheels, the company armed it with a dual channel ABS. it not only stops the bike but also ends up the risk of skid while harsh braking.